For many students with big dreams, scholarship can be quite the deal for them. However, it isn’t an easy aspiration to be successful in their future. Scholarships often come with certain conditions. 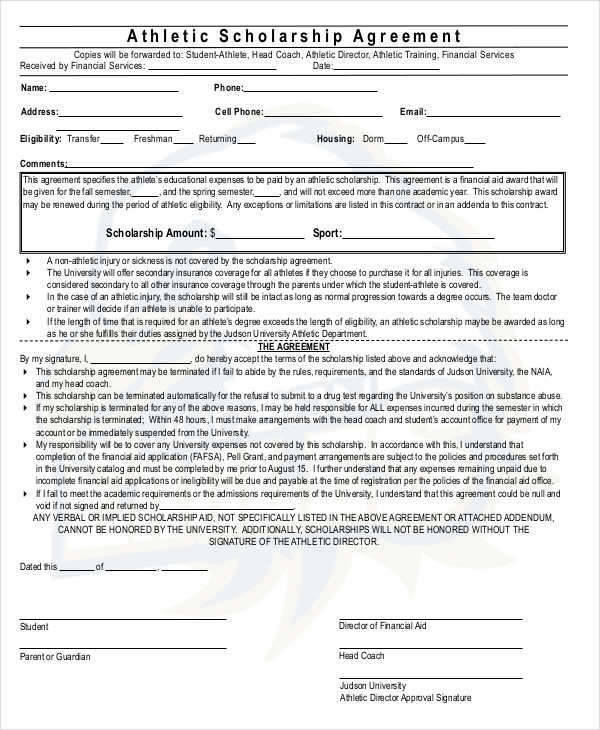 It literally takes signing a contract to get a scholarship. The things one has to do just to finish school, huh? On this list, you will find 7+ scholarship contract templates that you can download and then use for yourself. They’re sort of like contract agreement, but for scholarship. If you want to know more about employment contracts instead, then we also offer employment contract necessary for you to check out. When you’re writing a scholarship contract, you should know what makes the parts of a scholarship contract. Technically, it’s like writing a sales agreement contract, service contract, or any other contract in general. 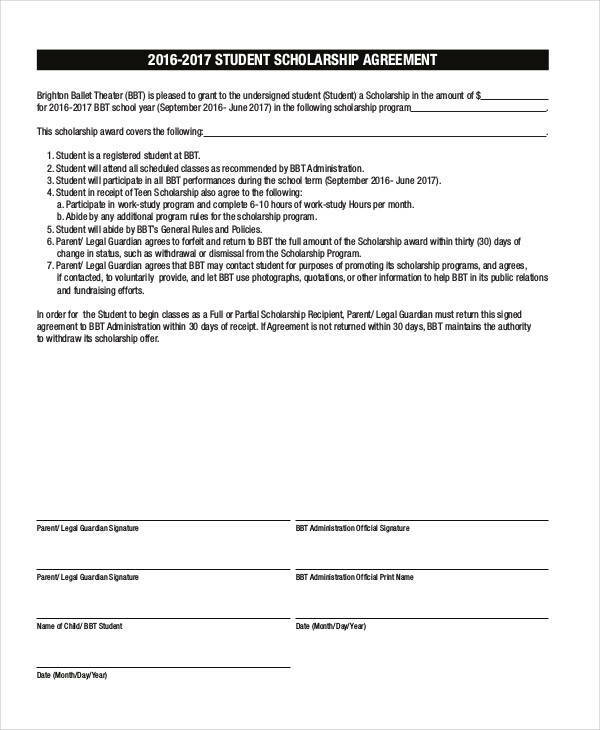 But a scholarship contract should have the conditions of the scholarship, including details of what the scholarship entails. 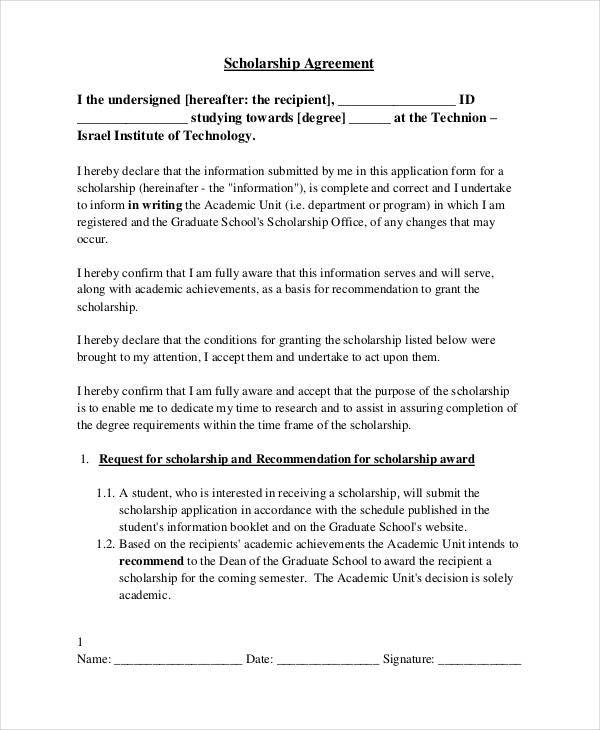 In the process of writing your scholarship contract, you can take careful note to include all the details necessary for the scholarship contract to take effect fully with everything understood. 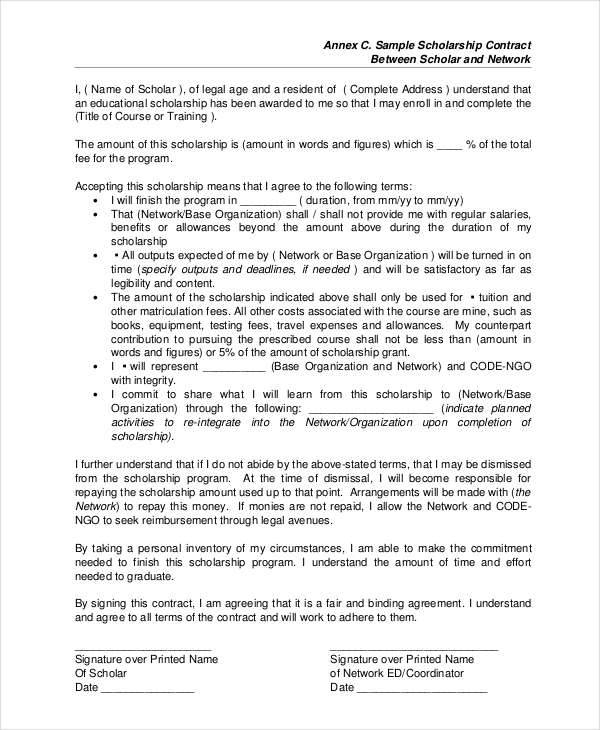 You shouldn’t hold back in giving out details for the scholarship contract you are making so that there wouldn’t be any problems in the future. A different type of contract is called an operation contract. There are many types of operation contracts, but they all have the same basic function. 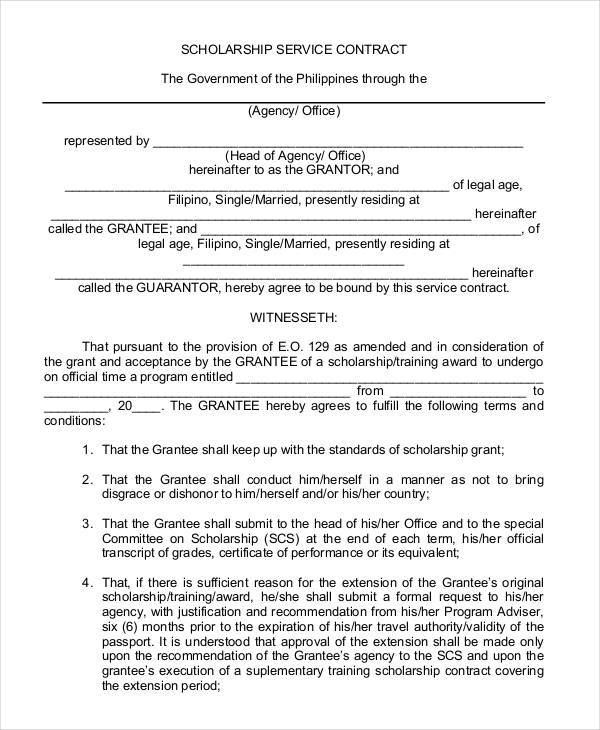 A contract that is mutually agreed by all parties to do a certain operation. Operation contracts typically have details of how the operation should take place and details regarding the condition of a certain operation. Operation contracts are usually done by two or more parties—usually two different companies—who agreed to certain conditions to work on an area. For example, a government agency asking a construction company to fix a certain road. This is where operation contracts are usually used. You might be interested in this type of contract, so we thought to mention it. We have those available for you as well as contract termination templates and management contract templates, and many other kinds of contract templates on our website. These scholarship contracts can benefit you for a variety of reasons. 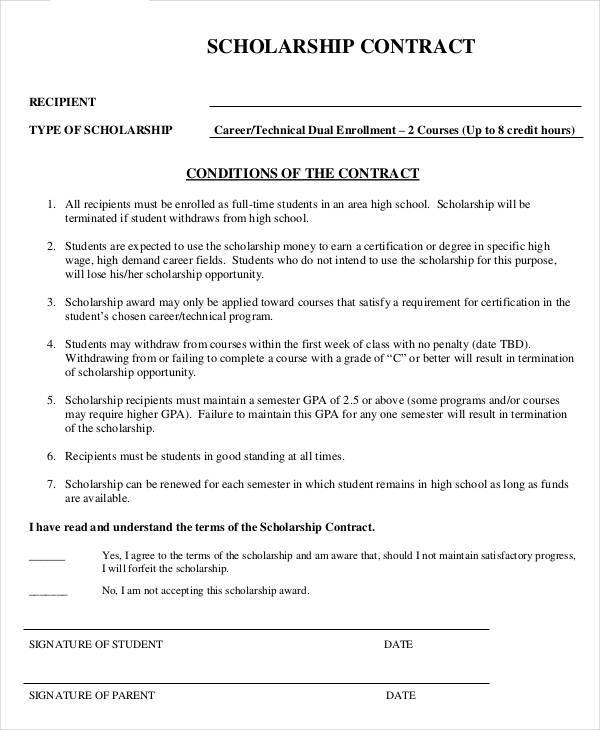 Many schools use contract agreements to offer students a way into their scholarship program. Most of these contracts are usually given to students who have shown exceptional talent throughout their academic history. Scholarship contracts can help scholars know the conditions of their scholarship as well as what they have to work for. 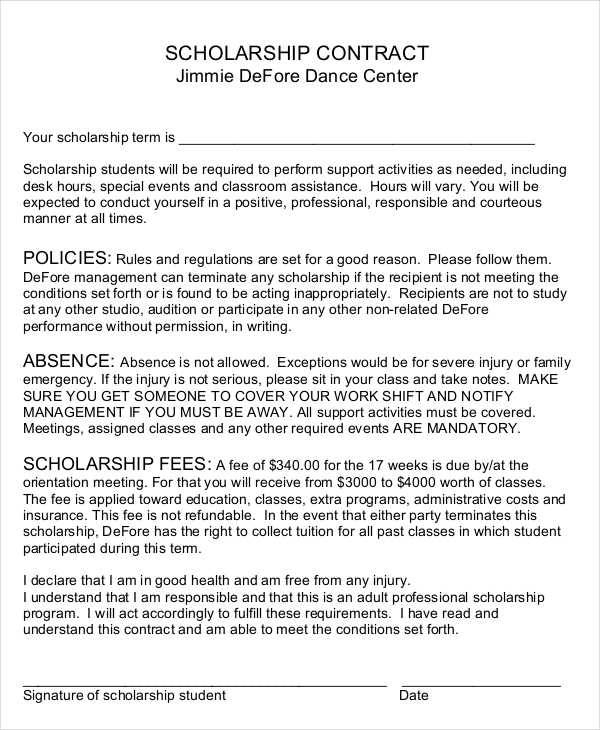 You can consider scholarship contracts just like performance agreement contracts. They set a standard of what many students who aspire for scholarship should follow. 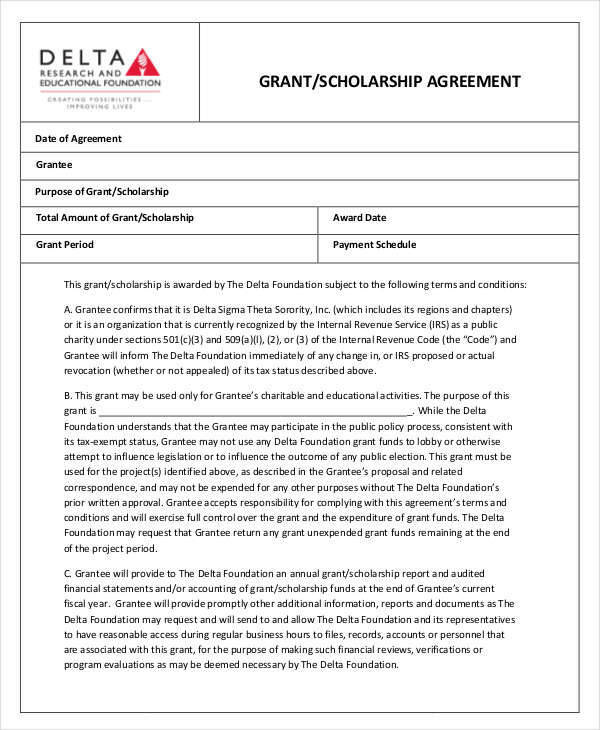 With these contracts, both parties have been confirmed to mutually consent to the scholarship given to the student as an opportunity. The scholarship contracts that we offer can help you make a contract for your own, so long as you follow the format provided. You should have very little to not trouble when making a scholarship contract of your own. We hope that this list helped you with what you needed, and that you continue to use us for your future needs.